I didn't mean to watch it. But I kept hearing all this Honey Boo Boo stuff and I finally had to check it out for myself. At first I was like, what's TLC getting at making fun of these people--and maybe they are making fun of them just a little--but then as I watched on, I was horrified as I slowly but surely fell in love with Honey Boo Boo and her Boo Boo crew. 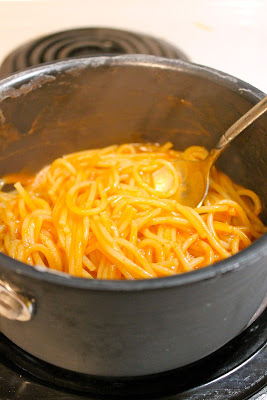 After watching Honey Boo Boo's mom make "sketti" I just couldn't get it out of my head. Because it looked like spagetti-o sauce to me, and that really intrigued me. Deeply. And yesterday, you see, I was sick. I didn't feel like eating anything. 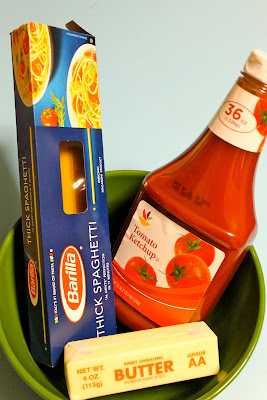 But then I thought about sketti because I was thinking about the season finale of Honey Boo Boo. For those of you blissfully unfamiliar with said sketti, it's spaghetti with butter and ketchup as the sauce. Yes, it sounds really gross...but also really good. If you are sick, or hung over, or in any state where you couldn't possibly feel any worse about yourself, then this is the recipe for you!!! 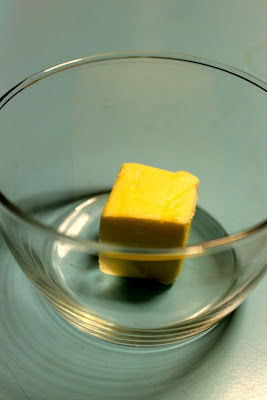 Two tablespoons of butter.... placed in a microwave safe bowl. I stepped up my game a little from Honey Boo Boo's style and used glass instead of plastic. Because I am willing to eat ketchup and butter mixed together, just not heated in plastic. No need to measure the ketchup--just do what I did and give 'er a good squeeze and count to four! You can boil 1/4 pound of pasta or use leftovers. I had no leftovers yesterday. 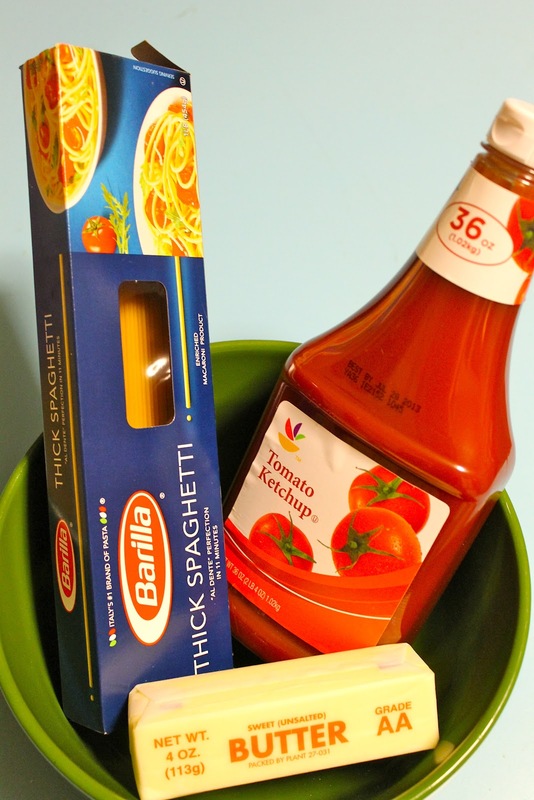 In the last minute of the pasta cooking, pop your ketchup/butter mix into the microwave for 1 minute and 30 seconds. If your microwave works better than mine, it may only take 1 minute. Drain your pasta. (I know you all will be so disappointed to know that I didn't throw it against a dirty cabinet to know if it was ready or not, but I just magically knew). Return it to the pan and pour your "sauce" over it. Now I did eat mine off of a plate; which is more than I can say for the way Boo Boo's family ate. The one sister ate hers out of the margarine container. Can't believe it's not butter? Your heart can't, either. Oh and for my Bossy Italian twist, I added parmesan cheese, because, let's face it, it couldn't get any worse than eating butter and ketchup as a sauce. Seriously though. It was goood. And I ate it all. I feel bad that I even know about this because I feel like it's a totally blasphemous thing to eat, but that even knowing that, it's gonna get made more times than I am willing to admit. Boil a small pot of water on the stove. Add pasta to boiling water, reduce heat slightly and boil according to manufacturer's directions until tender. 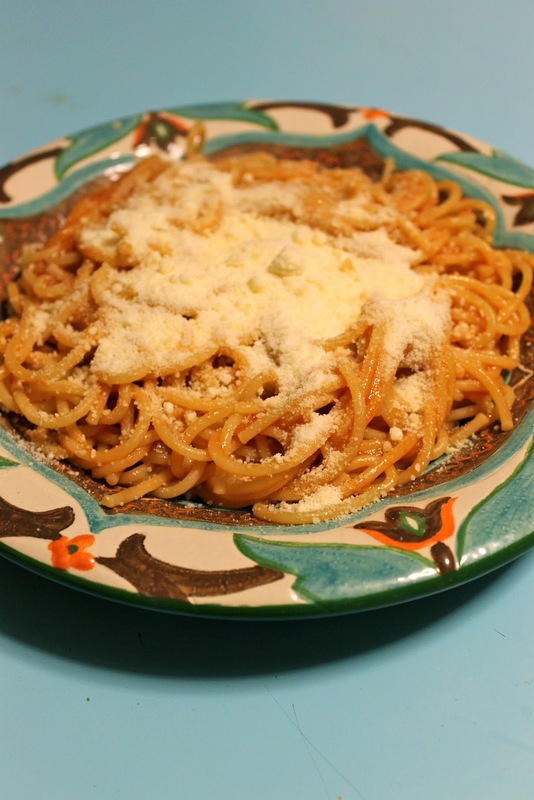 If you want to know if your pasta is done, throw it against your wall or cabinet or ceiling. If it sticks, it's ready. While pasta is cooking, put 2 tablespoons butter in a microwave safe bowl. Squeeze bottle of ketchup over the butter and count to four. That's enough ketchup. Set aside. In the last minute of the pasta cooking, put your butter and ketchup in the microwave and microwave on high 1 minute to 1 and 1/2 minutes (until butter is melted). Drain pasta and return to the pot. Pour the "sauce" over the pasta and stir. Serve on a plate or in your favorite plastic tupperware and top with parmesan cheese, if desired. Happy Honey Boo Boo Sketti! i must say, after the sketti episode on honey boo boo, i too was intrigued to make this concoction and honestly, best sketti ever. 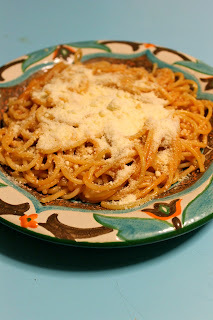 i find myself eating this easy to make meal often now that the word sketti has entered my vocabulary.